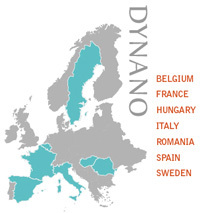 by oral presentations of ERSs/ERs from DYNANO and a DYNANO's SB meeting. The event was located at the European Membrane Institute (IEM), Montpellier, France. Bus stop: VERT BOIS, Bus N°22 and bus "La Navette (13)"
From the city center, take Tram 1 direction MONTPELLIER - Mosson stop at Universités Sciences et Lettres, cross the street, and take the bus "La Navette (13),stop VERT BOIS. IEM is at 5 minutes walk from the bus stop. You can buy tickets at the ticket dispensers available at each tramway station and in many newspapers shops. To buy Passes, go to TAM office, next to railway station.